Since 1946, the U.S. honeybee population has decreased by half. Around the world, honeybees are disappearing at a similarly rapid pace. This trend has scientists concerned: diversity in the fruits and vegetables people eat would decrease too, since some crops are almost entirely dependent on bee pollination. In fact, according to TIME magazine, “1 in every 3 mouthfuls of food you’ll eat today” is, in some part, thanks to bees. Bee productivity adds $15 billion to the farming industry each year by increasing crop diversity, farm productivity, and grocery store revenue. To illustrate the importance of bees, a Rhode Island Whole Foods temporarily removed all produce pollinated by bees. 237 out of their 453 products were effectively eliminated. “Honeybees are the glue that holds our agricultural system together,” said journalist and author Hannah Nordhaus in her book, The Beekeeper’s Lament. Further, it’s almost impossible to raise crops commercially without the help of pollinating bees. For example, farming in southwest China has become more labor-intensive due to the loss of bees. Crops like almonds, apples, avocado, broccoli, and onions depend on bees for them to grow. Faced with a decrease in their population, many of the farmers in China have turned to hand pollination, which takes twice as long as bees doing it themselves. Scientists studying the consequences of the declining bee population named the mysterious disappearance of bees “colony-collapse disorder” (CCD). 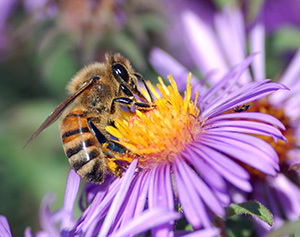 Some believe that agricultural pesticides like neonicotinoids cause CCD and affect bees even when what is thought to be safe doses are administered. Others believe CCD is caused by what some call “piss-poor beekeeping” (PPB), which, as it sounds, refers to the inability of beekeepers to keep their colonies in proper health. Still others say we’re suffocating the bees by planting crop monocultures. Bees need flowers and wild space to survive, but monocultures—areas in which only one crop is planted—prevent that. These areas seem like a big desert to the bees because of the lack of crop diversity. Going forward, scientists hope that planting bee-friendly flowers and not using pesticides on them will provide bees the pollen they need to stay healthy. Ultimately, this could help keep our meals nutritious.